The engine behind the biggest wrestling game on mobiles now brings the revolution to MMA – featuring 300 fighters spread across 5 promotions and 5 weight classes! Immerse yourself in the sport however you choose – from a career as a ranked fighter to booking cards in the first ever fully playable "Promoter" mode. With a revamped control system tailor-made for MMA, every move is at your fingertips as you use your mind as much as your body to win this game of human chess! Upgrade to "Pro" to enjoy each career mode at its best with no limitations – starting with anyone, anywhere. There is also a further "Backstage Pass" for those who want to save their changes to all 300 fighters and pit them against each other in dream bouts. With every rule at your discretion, you can either be a purist for 1-on-1 fights or blow off steam in ridiculous contests featuring up to 10 fighters! Please note that this game depicts a fictitious universe and is not affiliated with any real fighters or promotions such as UFC or WWE. Reviews will not be seen by the developer. Please e-mail Mat@MDickie.com for support. 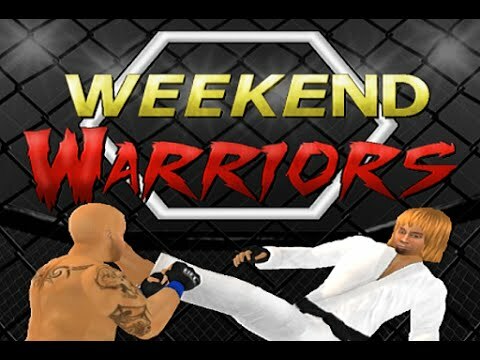 Скачайте бесплатно Weekend Warriors MMA для Android на русском языке. Последняя версия с официального сайта разработчика MDickie.